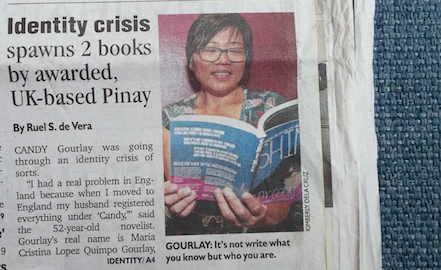 I was featured on the front page of the Philippine Daily Inquirer yesterday! 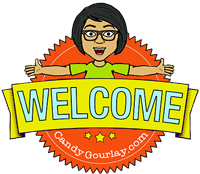 Find out about my identity crisis here (just in case you are not from the Philippines, the nay in 'Pinay' sounds like 'buy'). Thanks to Ruey for writing such a comprehensive article that had to be continued on two further pages. But no thanks for mentioning my age within the first two sentences! 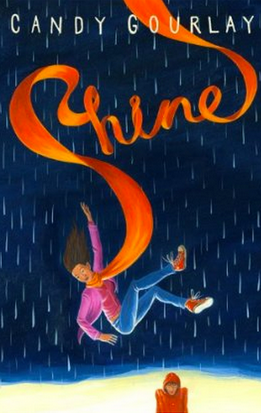 It was also Ruey who gave Shine a very nice review last August. When Ruey interviewed me, he said it might appear on the Culture section of the Inquirer, not on the front page, so this was very exciting indeed. 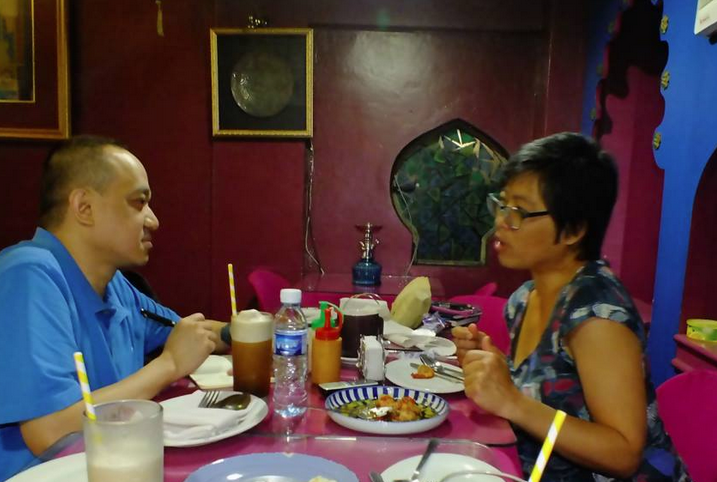 I was interviewed by Ruel de Vera of the Inquirer. We met at a fascinating restaurant called Ziggurat. The menu was created by Filipino cooks who used to work for the dictator Khadafi. Delicious! But searching for a copy of the Inquirer in the hotel lobby, I discovered they only stocked the Star. OMG. Olga was a childhood playmate. I hadn't seen her for maybe 30 YEARS! Olga then took me to meet her family. I couldn't help but notice that one of them was leafing through the Inquirer. 'This is Renato Reinoso, CEO of the Inquirer,' Olga said. CEO? Of the Inquirer? Whaaaa???? And yes, they gave me a copy. 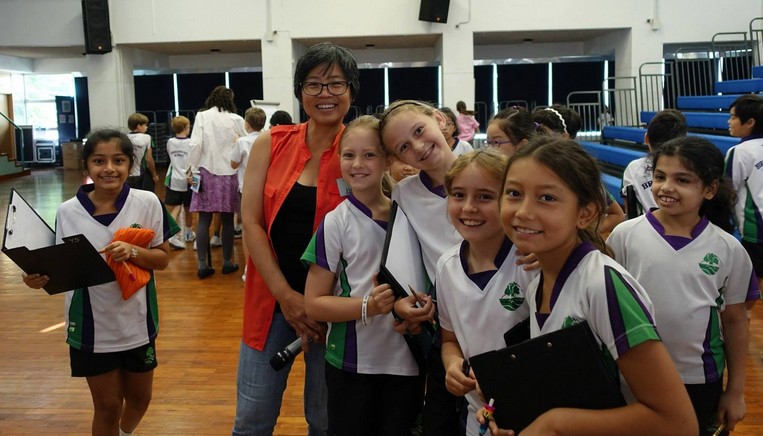 Last week, I was in Hong Kong and visited Bradbury and Glenealy schools. I was supposed to visit Peak School as well but sadly that chance was blown away by Typhoon Kalmaegi. 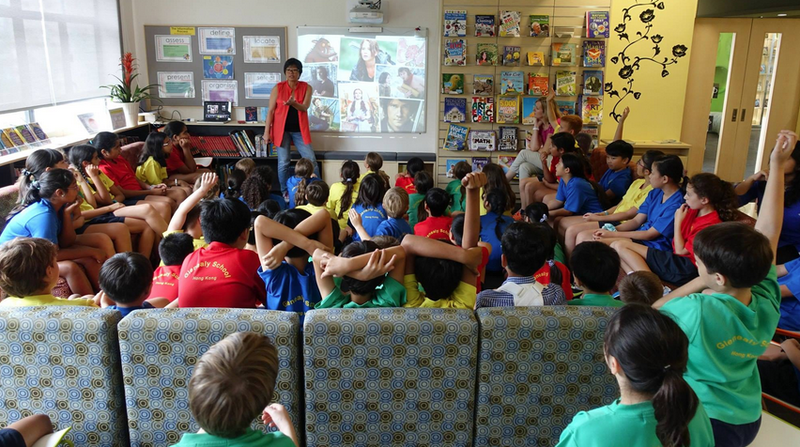 I will be telling the young people from these schools about my long journey to becoming an author. It's definitely gonna be fun, it's probably gonna be tiring ... I just hope it won't be FATTENING as well. Filipino hospitality is so unstinting I usually find myself offered tasty treats at every single stop of a Filipino book tour. Sadly, I am usually far too polite (and greedy) to refuse. Alas, poor waistline. I knew her well. On Saturday morning (27 September), I'll be running a Write Away workshop. Write Away writing weekends are open to young people 7 to 17 years old. The current programme offers opportunities to interact and write with a published author -- and this Saturday, it's gonna be me! The Saturday workshops are run by Where the Write Things Are, a centre for lovers of writing of all ages. The centre is the brainchild of Neni Sta Romana Cruz, author of some of my favourite Filipino children's books and a fellow journalist from the Marcos era. What am I going to do? Well, I don't want to spoil the surprise but there are going to be lots of chances to write and draw and show off your work. Contact 0917-6240196 or writethingsph@gmail.com for more info. ASAP! It's this coming Saturday and places are limited! Yes, that is fish. Dried anchovy. We call it dilis. What was it like? 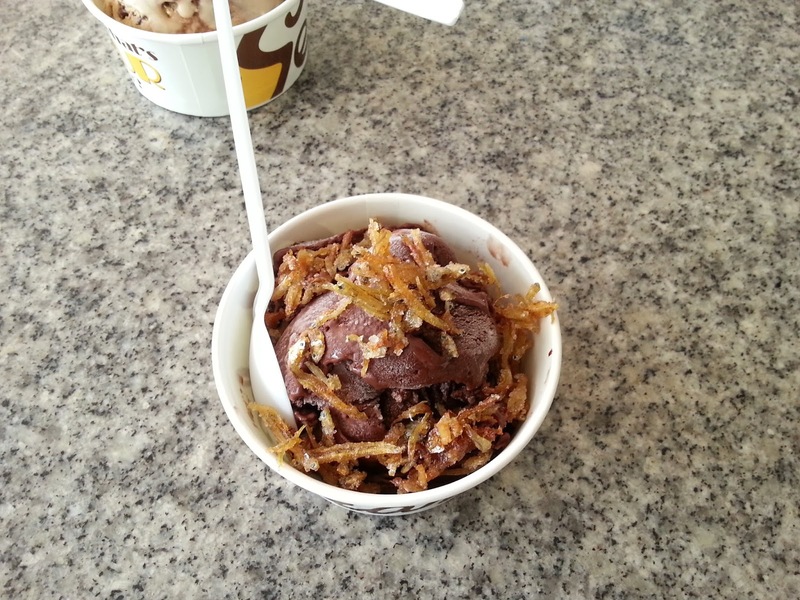 It was like Caramel Salt ice cream, except instead of salt, you have crispy bits of dried fish, and instead of caramel, your ice cream is made of chocolate sticky rice porridge. Was it good? Ye-es, but I think if you're not from the Philippines, it might be a taste that needs a bit of acquiring! 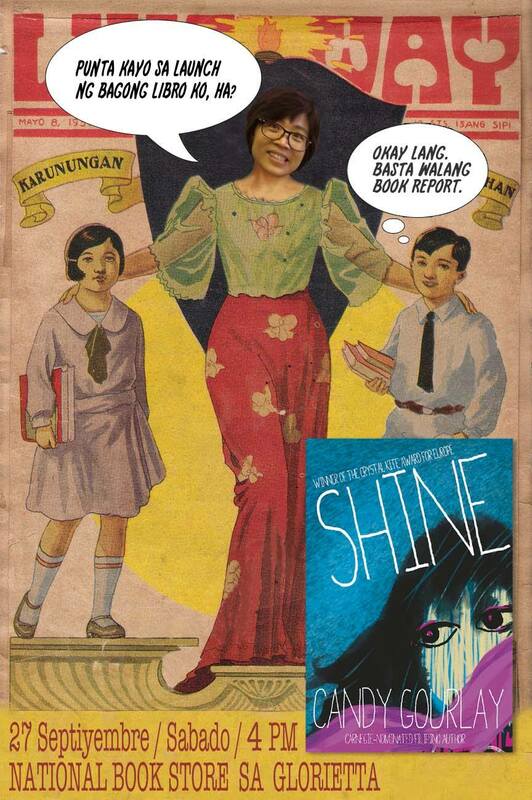 It's just five more days till the launch of Shine, Philippine edition. Are you coming? Awesome post, Candy. It looks like you're having a great time. You know what's wonderful? Meeting teachers and librarians in my native land who are absolutely PASSIONATE about books. It's awe-inspiring.